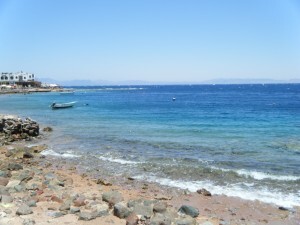 Dahab, on the Eygptian Sinai peninsular in the Red Sea, is a friendly place with some very good diving. It is most famous for its Canyon and Blue Hole dive sites, but it has many others - some arguably better than these most well known dives. The diving in Dahab is mostly shore-based: the sea quickly drops off to great depths. More remote dive sites are reached by boat, or by camel. The Red Sea is very salty. Its salinity reaches 41 parts per thousand compared to 35 parts per thousand in oceans. This is due to the lack of rivers adding fresh water to the sea, and the hot weather causing evaporation. Make sure you use more lead than you would normally. 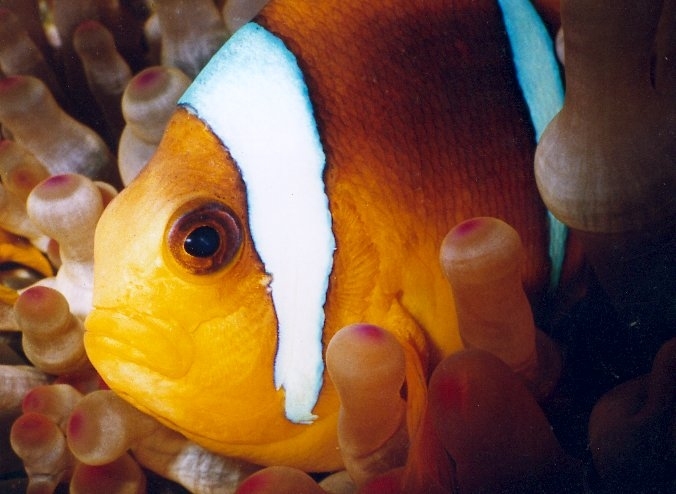 Although the Red Sea has been connected to the Indian Ocean for millions of years, it still has many unique species. This may be because of adaptations to the increasing salinity over time. There are also adaptations to warm water. Recent research has shown that Red Sea corals are resistant to harm from warming seas. The scientists explain this by the existence of a "warm-water barrier" at the southern Red Sea, allowing only heat-tolerant corals to enter. The nearest airport to Dahab is Sharm el-Sheikh. Although flights from the UK are still not flying to Sharm, many European airlines do offer direct flights. Dahab means "Gold", and it was named by the Bedouin for its golden sands. Some divers consider Dahab to be a bit out of the way, but if you like relaxed diving with just short walk into the water, then Dahab is well worth a visit. Diving generally involves a short drive up or down the coast to a Bedouin cafe where you have a cup of tea before getting changed and walking into the water. After the dive you return to the cafe for lunch. If you have older children they can remain in the cafe whilst you dive; or go horse or camel riding along the beach. Whilst once the exception, boat diving is becoming popular in Dahab. It is replacing the camel safaris down the coast to dive sites inaccessible by road. To be cost-effective the boats need to be full meaning that several groups of divers are in the water, on the same dive, at the same time. The dives are listed from North to South. "All amazing dive sites, especially Islands, Eel Garden and the Canyon. Crystal clear water, excellent vis, beautiful fish and coral etc. Regarding accommodation, Oasis Fighting Kangaroo had some brilliant rooms for about £1 a night. " "Good shore diving with amazing corals. Loads of fish including Napoleon wrasse. Good for all levels, some difficult dives with fierce currents. " "Look out for the Red Sea Walkman when diving in Dahab. I have dived a lot in the Red sea but have only found it there. " Note: The Red Sea Walkman or Two-Stick Stingfish (Inimicus filamentosus) is a scorpion fish that can use its front fins to walk over the sea bed. El Bells is a short walk north of the Blue Hole. Enter by diving down a narrow crevice to a chimney which is open at one side. At 26 m you can pop under an arch and out onto a wall dive. An excellent entrance. Alternatively you can carry on down to 30 m before exiting the chimney. Keep the wall on your right and look out into the blue on your left. A lovely dive. Follow the wall, with its overhangs, until you reach the Blue Hole. You can enter the Blue Hole at 7 m. The hard coral is splendid outside the Blue Hole: a carpet of colours and textures. Inside the Blue Hole, though, the coral is disappointing. Swim round the Blue Hole and exit onto the shore and to the Bedouin cafes. The Blue Hole is just that - a very large hole about 150 m in diameter and dropping to 110 m.
We previously dived the Blue Hole in 1990 and were somewhat taken aback by the change to the on-shore environment. When we visited then, we were the only divers there, and it was at the end of a track which went for miles through unpopulated desert and felt like it was at the end of the world. Now there were about 50 vehicles (in summer the number rises to 200+), and either side of what is still a track are Bedouin cafes and tents for the divers. The Canyon too, seems overdived; worth doing, but probably best as a privately organised dive either before or after the commercially organised groups fill it up. A tunnel at 52 m connects the Blue Hole to the sea. The tunnel is long, over 26 m. The Blue Hole itself now has few corals inside it. It is quite interesting watching the free divers though, looking like elongated seals. There is much more sea life outside the Blue Hole - exit through a dip in the wall at 7 m.
"Lovely dive, coral wall, sea bottom over 800 m below, just a blue expanse below hence name. Several plaques to divers who died here at entry point. A bit scary to see but no need to be (apparently a tempting underwater arch at 55 m has caught a few over adventurous divers out) no danger to well behaved divers and well worth a visit. Lots of fish life: parrot fish, trigger fish, lovely coral, exciting water entry!" "fantastic diving! Great for deep dives along coral wall. Not too touristy either." "Done as a full moon night dive without torches, stunning! " "Unbelievable! Plenty of life, beautiful corals, lion fish, turtles, (too many things to remember) excellent vis, no words can describe! " "One of the best sites in the Red Sea "
"The Blue Hole has it's own magic - we are not sure how a 70 - 105 m deep crater (about 40 - 60 m in diameter) in a shore reef 5 m from the beach came into existance. That's not all. It has a washed out arch starting at 53 m below the surface, best dived around 60 to 65 m, just magic diving through on your back, like looking at a large bridge from underneath! The deep blue due to less sunlight, the sheer straight walls down, then the arch! Great! " North of the Canyon. An extremely gentle drift dive. Reef goes down to around 14 m then small coral outcrops on sand. Look out for large Napoleon wrasse and, at the tiny end of the spectrum, the Red Sea Chelidonura (Chelidonura flavolobata). Just few centimeters long, this is a kind of nudibranch which looks dark red in natural light or dark blue if you shine a torch on it. It has two yellow head lobes which look just like sticky-out eyes. Only found in the Red Sea. One of the renowned dives of Dahab is the Canyon which starts at a round coral bowl - the fish bowl, with lots of glass fish, and descends as a tube down to around 50 m. (At the moment the fish bowl is closed to preserve the coral.) The tube is has openings in the top at which provide access and escape at various depths. Drop in through the top at a depth of 18-20 m into the canyon. The canyon keeps going down so is popular with technical divers. "Especially for a night dive - can get very busy so make sure you can identify your dive buddies "
"Amazing life, rays, lion fish, stone fish, eels etc etc. Cleaner fish swim into your mounth clean your teeth, great experience! " "Nice underwater structure descending to 30 m with big mad fishball lurking inside. Enjoyable dive for AOW. " Named after the colony of garden eels (Gorgasia sillneri) that populates its sandy slopes. A gentle, shallow dive with schools of Barracuda and many hard and soft corals. "Very surreal. Hundreds of eels standing vertical out of the sand slowly retreat back into their holes as you swim closer. Looks amazing with an awesome blue background! " "Wonderful eels on a sandy floor. As you go forward on your dive they start to dive in the sand - words cannot describe the beauty. " Dive at the end of Masbat, to which you can walk from many of the dive centres. It is a lovely little reef from the surface to 10 m or more. A man-made underwater playground is nearby. Look out for the Ghost Pipe Fish, Solenastomus cyanopteris. This little fish looks exactly like a stray piece of old sea grass or seaweed. Also the Pharaoh Cuttlefish which is very pretty with beautiful blue edging. The Islands are just south of the town and are formed by a coral porites platform criss-crossed by gullies producing a confusing topography, and ideal for a shallow dive (17-18 m). Dolphins come close to shore and transit up and down the coast for week or two each year when the temperature drops in the winter. If not dolphins then you'll see schools of Yellowtail Barracuda (Sphyraena flavicauda) and Twinspot Snapper. The entry is marked by a noticeboard on the beach. Best to enter the sea at high tide. Moray Gardens and Golden Blocks are close together, about 10 km south of Dahab. Look immediately you start the dive in the sandy shallows for some very interesting fish. At around 2 m for example you may find a Short Dragonfish, Eurypegasus draconis. This is the only place in the Red Sea that I have seen one of these small, boxy, armoured fish walking along the sand propelled by its pectoral fins. Another interesting dweller of the shallows are pairs of ghost pipe fish. These red cryptic fish look more like old bits of seagrass than fish. You might also see a moray as indicated in the name. From the Bedouin cafe walk along the beach to the left, past the sunbathers in front of the Happy Life Village Hotel until you reach a sign showing a map of the dive site. Look out for the long double-ended pipe fish at the sandy start of the dive - which I have only seen in Dahab - and the flatfish Moses sole, which secretes a skin toxin which has been successfully used as a shark deterrent. You may also be lucky enough to see a turtle and a large Napoleon wrasse cruises the area. A large fan coral lives at around 20 m.
"Lots of nice fish life: turtles, lovely pipefish, cornet, trevally, lionfish, even a few squid. Nice snorkelling between dives. " The most southerly dive of the bay featuring the Moray Gardens and Golden Blocks. Entry is in front of what looks to be an unused Bedouin cafe. A sign points to the Caves. At high tide it is easy to drop straight into the water by the road. Swim south east into the first, shallow, cave. Further north there is a canyon leading up to the surface. From here you can swim back south along a drop off, finally visiting a final cave at 10-15 m, just south of the first one. The diver surfacing in the video at the top of the page is about to exit the Caves dive site. Reef dive. Good coral formations. Reached by boat or by camel. Gabr El Bint, or Tomb of the Girl, is a wall dive at the north end of a bay. Dive down a sloping reef until you reach the wall between 8 and 20 m. Following the coastline, the wall drops to depths well past 50 m (164 ft). There are some lovely corals here, especially on the edge of the lagoon where they are spectactularly unspoilt. "Great dive, lovely grassy area on top of the reef then a drop about 5 metres to a sort of ledge where you can see into the blue and then you can swim round the wall a bit and swim back up onto the grassy areas where then you almost freefall further to another ledge then back the way you came again! Great dive saw loads of fish, turtles and massive fan corals. Really clear water about 30 metres visibility literally! I recommend! " An hour south of Dahab by boat, El Shugiarat means "branch of a tree". From a boat you drop in off the reef then swim to the top of a canyon. This great crack starts at 18 m and carries on to 60. When you reach your maximum depth pull out to a forest of fan coral (Anella mollis). You can then zig zag up the sloping reef looking for the shy Longnose Hawkfish (Oxycirrhites typus). Even if you don't see this pretty hawkfish, there are swarms of anthias, both Lyretail and Red Sea (Pseudanthias squamipinnis and Pseudanthias taeniatus). Adding to the beauty of the lower reef are bundles of Red Cluster Whip, Ellisella juncea. Dahab roughly comprises 4 areas: Dahab City in the south, Lagoona where the windsurfers congregate and Mashraba and Masbat which hold most of the dive centres. Mashraba and Masbat are within walking distance of each other. Masbat is home to most of the shops and is the busier. 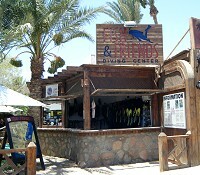 The dive centres very often have a hotel attached. If you do 10 dives it will cost you around 17 Euro per dive. There are around 40 dive centres in and around Dahab. Have you dived in Dahab? Rate your diving centre here. Desert Divers dive from the shore, with a cup of Bedouin tea on the beach and a chat around the fire. On their Camel Diving Safari they go to remote places north and south of Dahab, like Gabr El Bint (a National Park area) and Ras Abu Galoum (a small Bedouin Village). Named from the first 2 letters of owners' first names: Ingrid and Mohammed. 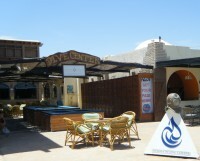 One of the first dive centres in Dahab, established in 1988. You can stay with them or they will pick you up from your hotel and provide childcare for you whilst you dive. Drive you up or down the coast to the dive site where you base yourself in a Bedouin cafe between dives. You can dive their house reef without a guide which is compulsary for most of the rest of the dive sites around Dahab. Highly recommended. "Really friendly dive masters! 18 Euro per dive. GREAT dive sites!! Definitely recommend doing your advanced nitrox courses with them so you can dive the magnificent Blue Hole! Excellent value for money! Best place I have dived so far (havent been many places yet though). Dive centre linked with a hotel but be prepared for BUDGET accommodation. Salt water showers, suspiciously "clean" sheets. At only �6 per night, including the all-important air-conditioning, you can't really expect more. " Read more about the Penguin hotel below. "Very accommodating and friendly, denifinately dive with them again "
"About £25 pounds per dive including all equipment. All shore dives. Friendly people. Dives quite relaxed and laid back. Instructor very good and assistants were all decent people. Would dive with them again. " Accommodation in Bedouin Lodge Hotel, restaurant, daily shore diving, boat diving, camel dive safaris, desert safaris by jeep and camel. Tel: 00 20 (0)69 / 3640 317 or 3641 125. "The best diving club ever. " 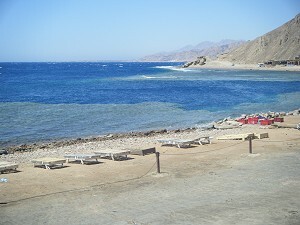 "I went to Dahab and stayed at Blue Beach Club Hotel which was amazing and has its own dive centre. However i got my open water PADI at Nesima dive centre with Gamal as my instructer. I would highly recommend this centre as the staff were all friendly and polite while enjoying their jobs. They have there own fresh water swimming pool which is unusual in Dahab, where you learn all the skills you need to go out into the Red Sea. When you are ready the dive instructors take you to some of the most beautiful dive sites in Dahab such as the Blue Hole, the Lighthouse (right in the middle of the main sea front) and of course the spectacular eel garden. I seriously urge you to go to Dahab and try the diving: it will blow your mind and I promise you once you've gone once you will want to go back again and again. " 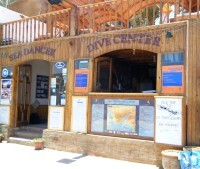 "Excellent dive centre at the Blue Beach Hotel (edit: now moved to the Tirana Dahab Resort). Experienced, friendly staff went out of their way to accommodate our needs. Excellent, well looked-after equipment and very safety conscious. Great deals if you book accommodation at Blue Beach and diving together. " Established 2000. At the Ganet Sinai Hotel and Tangerine Dream Hotel. PADI 5* Gold Palm Resort located in a 3* hotel directly on the beachfront and 5 minutes walk from all the facilities of Dahab. Offer all PADI courses, dive packages, boat and camel dive safaris around Dahab and Sharm. "Friendly crew, they make you feel welcome and at home. Dive sites in Dahab are fantastic. Love it. Thank you Aqua Divers, will be back soon :-) "
A family run operation, catering for groups of young adventurous travellers. Despite a recent opening, boast a team of instructors and dive masters with plenty of experience within the diving and tourism fields. Part of a Swiss chain of four diving centres in Egypt. "Diving holidays which combine both safety and fun whilst experiencing a whole different culture in a truly unique atmosphere. Small groups, personal attention to all divers." "I've spent one week with the Deep Blue Divers staff,and really enjoyed diving with them. Lead by Ayman,the instructor, we discovered many amazing underwater reefs, corals and coloured fishes. We went also to a protected dive zone, with camels because no way by cars. HUGE. The prices are low too. Thanks a lot to them for their kindness, I'll return soon there to share more diving adventure. Accommodation is Deep Blue Dorm, just above the dive center." 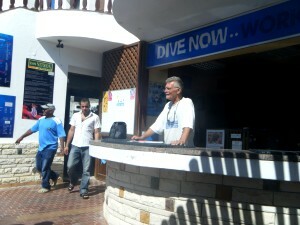 "Deep Blue Divers, Dahab, affordable prices, for sure I dive with them again. " "H2O Divers Dahab are a professional and friendly dive centre with great facilities. 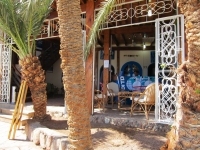 The best centre in Dahab "
"H2O Divers Dahab are a fantastic diving centre. I've been to lots of dive centres around the world and have already visited Dahab. I stumbled across H2O rather than my usual dive centre and they are faultless. They are a new dive centre but all the guides have been around for years. I decided to do a couple of specialties with them - Photo and Nitrox, the Instructors were so incredibly knowledgeable, I really learned a lot. " "Very professional and knowledgeable staff, would definitely come back, good value for money. (Accommodation was) Hotel Planet Oasis nice and clean, great location "
Dive Centre at the Lighthouse and also offer liveaboard safari to North's wrecks, Brothers, Rocky, Deep South in the Red Sea. "We know that diving in small groups is always safer and more fun, therefore we ensure we keep our group numbers small and that you always dive with others of a similar level. All PADI dive courses are available across all levels, from Open Water though to Divemaster. You learn under the care of our highly skilled and experienced PADI Instructors. Join us and enjoy the beauty of our reefs, secure in the knowledge that we care about your wellbeing, safety and enjoyment, along with a genuine desire to preserve and protect the underwater world. The Octopus World family welcomes you with open arms and looks forward to sharing unforgettable diving with you! " Camel dive safaris to the marine reserve of Ras Abu Galum, Boat Safaris to Gabr el Bint and the Thistlegorm, or a Desert and Dive combo. "Very relaxed diving - give it a try. Value for money = 8/10. " Reef 2000 is a PADI 5* Golden Palm Resort and IANTD technical training facility. Offer guided dives, weekly boat and camel safaris, Yoga diving, PADI courses all the way through PADI Divemaster and IANTD courses all the way through full Trimix OC diver (100m). Small groups: maximum 6 clients to one guide or instructor or maximum 3 clients to one guide/instructor in technical diving. Offers Nitrox, Trimix and Oxygen fills. "This hotel is home to the excellent Reef 2000 diving school. The hotel is not luxurious but it is very friendly. In the evening camels make their way home unescorted to the town from the Blue Hole. I have stayed at the Bedouin Moon several times, and I love it. " Located North of Dahab, near the Canyon dive site. All diving activities, PADI courses, introductory dive, snorkelling trips, camel or boat safaris to different dives sites and weekly trip to the Thistlegorm. Located only a few meters from the sea, "our house reef is already the proof that the diving in Dahab is not complicated". The easiest way to get to Dahab is to fly to Sharm El-Sheikh or Taba then travel overland up or down the Sinai. For airlines that fly to Sharm see our Sharm flights page. You do not need a visa for Dahab, so no need to queue up for one in the airport. Go straight to the passport control queue. Once out of the airport you can take a bus or a taxi to Dahab. Your dive company or hotel will often be happy to organise the taxi transfer for you. To catch a bus you will need to first get a taxi to the Sharm bus station. There are 8 buses a day. Water temperatures range from 20oC in February and March to 25oC in September and October. Those that get cold will need at least a 5 mm wetsuit, with some extra protection in the winter months. The hottest months above water are from May to September, with temperatures averaging 33oC in July and August. In winter temperatures average 18 or 19oC. The official currency is Egyptian pounds but Euros, pounds and US dollars are also widely accepted at restaurants and shops. There are several cash machines in Dahab. Few of the hotels and restaurants accept credit cards. Dive guide: one way is to use 10% of the cost of the dives. You might like to add more if you've had very good service. The dive guides only get paid for the days they work: they get no holiday pay so some of them never have a day off. Taxi fares - it costs less than 20 LE from Dahab to the big hotels on the Laguna. But if you get the taxi from the hotel it will probably cost you 30 LE. Always ask the price before getting in. There is no need to tip taxi drivers. 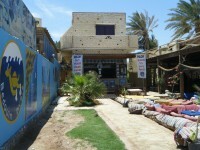 There are many restaurants in Dahab. One of the cheapest places to eat is the takeaway chicken restaurant - King Chicken - in the town, where you can also eat in. This serves excellent food. More expensive food is offered at the many restaurants along the sea front. You will be hassled to enter these - don't let this worry you. The people are very friendly and will give you good service. Not all the restaurants serve alcohol, but those that don't will generally let you go and buy your own from the off-licence. For Diving Insurance with diving down to 50 m, we recommend Essential Travel. Dahab is a popular destination for windsurfing and kitesurfing. For more details see http://dahabholidays.com/Windsurfing_and_Kitesurfing.html. Then there are the camel safaris, which may be cheaper booked through your dive company or hotel. If camels are too uncomfortable you can instead go horse riding on small, lovely-looking horses. For sight-seeing you will have to go quite a distance. St. Catherine's Monastery is a day trip. This is a 4th Century Greek Orthodox Monastery and location of the burning bush and Moses' Well. Specialize in desert trips enabling participants to experience the true nature of the desert, whilst preserving its unspoiled beauty. Bedouin Safari Tours endeavors to reach the places rarely visited by tourists. Finding some of the greatest views on earth still untainted by man. All in the same spirit and passion as the first intrepid desert explorers. Although the big travel agents offer packages to Dahab, you may prefer going through a small Dahab travel agent to book your accommodation and diving. However, if you are going at peak times when the flights are very expensive, it can be cheaper to get a package. Note that packages generally go to hotels out of town or on the Lagoon. 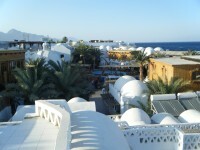 We used Dahab Holidays to book our accommodation and diving and were very pleased with their service. The prices were the same as booking direct and they organised our efficient taxi transfer to and from the airport. Located in Dahab, e-mail: info@dahabholidays.com. Travel agent organising diving holidays in Dahab, Sharm and Marsa Alam. "I would like to recommend the travel company Dive Sharm for organising our diving holiday in Dahab. We found them to be much better than some of our previous experiences with Regal diving or Longwood holidays. It was simply great and worth every penny. I believe they should be giving a mention on your website because your customers would have more choice. " There are three areas in which to stay in Dahab itself. Laguna is where the more expensive hotels are and where the windsurfers congregate. Up from Laguna are Mashraba and Masbat, home to most of the dive centres. Many of the dive centres have a hotel or apartments attached. Hotels are also dotted up and down the coast from Dahab. Accommodation in Dahab comprises hotels and apartments to suit all price ranges. The low-cost price range is well catered for with shared rooms aimed at backpackers. Mid-range are family rooms and the big chain hotels are also represented with the Hilton, Meridien etc around the Laguna. From Mashraba to Masbat along the sea front is a line of hotels, restaurants and dive centres. I would recommend staying in this area as you can walk around the shops and eat where you choose. Further out you are compelled to take a taxi if you do not wish to be confined to your hotel. However, taxis are plentiful and cheap. At the southern end of Mashraba. They have 20 rooms, some with a terrace overlooking the sea. For budget travellers they also have tiny backpacker rooms with a shared bathroom. Small swimming pool and restaurant. About InMo Divers dive centre. Located on the edge of Mashraba, it is around a 10 minute walk into town or to the sea front. They have a good-sized swimming pool and a range of apartment sizes. Basic cooking facilities in the rooms. Have a pool side bar for snacks. The owner was previously the manager of the Swiss Hotel. "Dahab: Try Ali's, next to police station. Around 15 euro per night for balcony room (2 beds so bring a friend and share cost), proprietor and local people friendly, rooms pretty basic, but that really doesn't matter. Sitting on a balcony overlooking a red sea sunset to the sound of evening prayer. Lovely! Bring mosquito net and spray though! " Next door to InMo Divers at the southern end of Mashraba. "Dive centre linked with a hotel but be prepared for BUDGET accommodation. Salt water showers, suspiciously "clean" sheets. At only �6 per night, including the all-important air-conditioning, you can't really expect more. " "You're going to the desert to go diving. Get a grip and deal with the saltwater shower - the accommodation is what you'd expect in asia for a similar price. Bargain - get involved. " "Blue Beach Hotel and diving with Blue Realm Diving together. " Hotel and dive centre at the northern end of Masbat. "Good value - food average - very friendly staff "
One of the last hotels before the Blue Hole. North of Dahab so will need to take a taxi if you wanted to go into the town to shop, visit restaurants, etc. "Nice enough rooms but food awful. " Big hotel on the Laguna. 4 star hotel on the Laguna. Let us know about your hotel in Dahab. Fill in this form. by David Revill, KINDLE, 2012.
by Helmut Debelius, KINDLE / ANDROID, 2013. For those who prefer hard copies, we recommend. by Simon Rogerson and John McIntyre, Paperback, Ultimate Sports Publications Ltd, 320 pages, 2007. In the main devoted to Egypt, but also covers Jordan, Yemen, Djibouti, Israel, Saudi Arabia and Eritrea. by Pete Harrison, 94 pages, 1996. Quite old now but if you can find a cheapish copy it is worth getting. A slim volume with detailed descriptions and line drawings of the dives around Dahab. Please add your comments on diving in Dahab. Do you want to recommend a dive operator? Let us know.